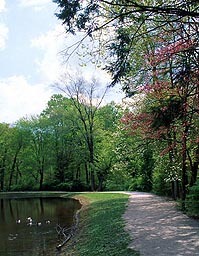 Trails are one of the most popular features in Fairfax County's parks. They link neighborhoods with parkland, offer fitness and recreational opportunities, provide safe and scenic off-road transportation routes, and allow us to step away from urban life and revitalize ourselves in the natural world. Fairfax County's park trails are often built in stream valleys where parkland vegetation helps protect the streams from pollutants and erosion. In addition to preserving our watersheds, this parkland nurtures diverse plant and animal life that benefit the environment and heighten the experience of trail users. 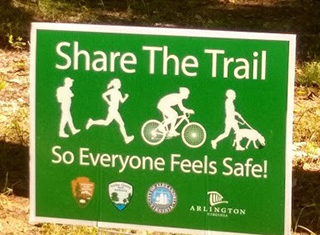 Learn more about trails in Fairfax County. Navigate more than 900 miles of Fairfax County trails, bikeways and sidewalks on the Fairfax Trail Buddy web map. Gifts for Trail Building and Care help to construct and maintain park trails and bridges, purchase land to connect existing trails, print trail maps, and install interpretive signs that inform and encourage stewardship of the county's history and natural resources. The fund contributed to the development of the celebrated Gerry Connolly Cross County Trail, a 40-mile path that runs through some of Fairfax County's most scenic areas, beginning at Great Falls National Park on the Potomac River and extending south to Laurel Hill Park and the Occoquan River. The official renaming of the Gerry Connolly Cross County Trail (GCCCT) took place in June 2014 after the Park Authority Board voted to rename the 40-mile trail in honor of the congressman. His leadership was instrumental in creating the network during his years as the Providence District Supervisor and then Chairman of the Fairfax County Board of Supervisors. The GCCCT is a strong symbol of community connections. It knits communities together that, in our fast-paced and diverse world, makes for a better life experience. “This project is a true example of what can happen when the local community, volunteers and our elected officials work together. Thanks to that effort we are leaving behind a real gem for future generations to enjoy,” stated Congressman Connolly. Three dedication signs interpreting the history of the GCCCT and trail markers were made possible through the 95 Express Lanes Grant program. Watch the short video from the dedication ceremony. Special appreciation is extended to these exceptional supporters who join the thousands of individuals who direct their generosity to help trails! Nancy Wilson donated in memory of her husband William "Bill" Vesey, who loved to hike, run and bike. Her generous gift and advocacy efforts helped to generate more than $12,000 in contributions to the Park Foundation trail building, beautification and maintenance. Cub Run Stream Valley Park Volunteer Team have raised funds for the trails that they help maintain via park clean-up events. A generous $25,000 grant from Dominion helped to fund a new fiberglass bridge, interpretive signage and upgrade a natural surface trail along the Chestnut Grove Trail in Lake Fairfax Park. The result allows residents of Reston and surrounding communities to enjoy improved access and linkage of the Chestnut Grove Connector Trail with other established park trails and facilities. Recreation Equipment, Inc. (REI) generously supported Fairfax County parks through the Park Foundation in excess of $60,000, including a recent grant that funded the design and installation of 15 signs featuring maps that direct trail users along the 41 mile GCCCT and other trails.